Braza flash tape is to women what duct tape is to men! 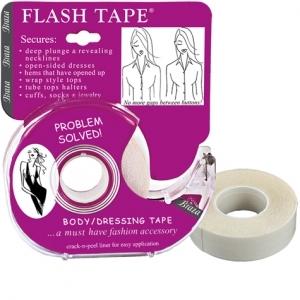 Use this double sided tape for all your bras, tank tops or whatever needs taping so you look your best! Enter below and be one of 5 lucky winners!! Giveaway sponsor is Megomania. So much more practical than the sticker versions that I've used before. This one lets you determine how big (or little) of a strip to use. This stuff is amazing, perfect for those shirts who have the gaping holes between buttons. That sounds like a great product for summer! Keep those bra straps attached to the clothing. My kids love doing crafts so we use a lot of tapes a lot! this will be perfect for those emergency wardrobe mishaps. This looks great, I so need some for work thanks for sharing. I would love to have this. Very useful for us women. Thanks for sharing! I have never been heard about this product, thank you for the information. And congratulations to the winners. Never heard or see this before. Thank's for sharing!